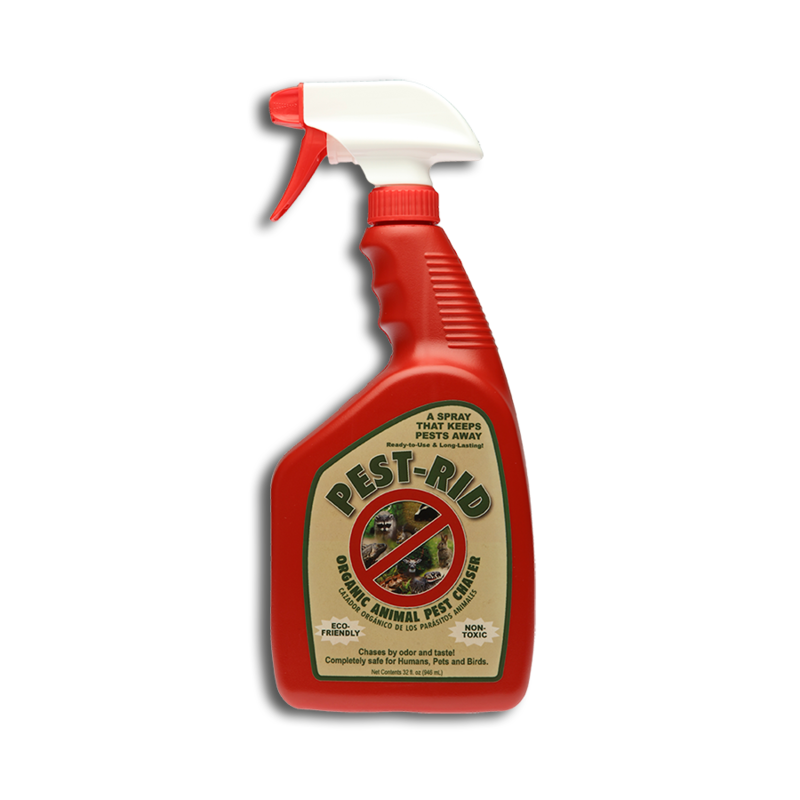 Pest-Rid 32oz Spray is a ready to use organic animal pest chaser that works by odor and taste – a spray that keeps pests away. Just Shake It and Spray It! Ready to Use – No Mixing Required. Safe for Humans, Pets & Birds. 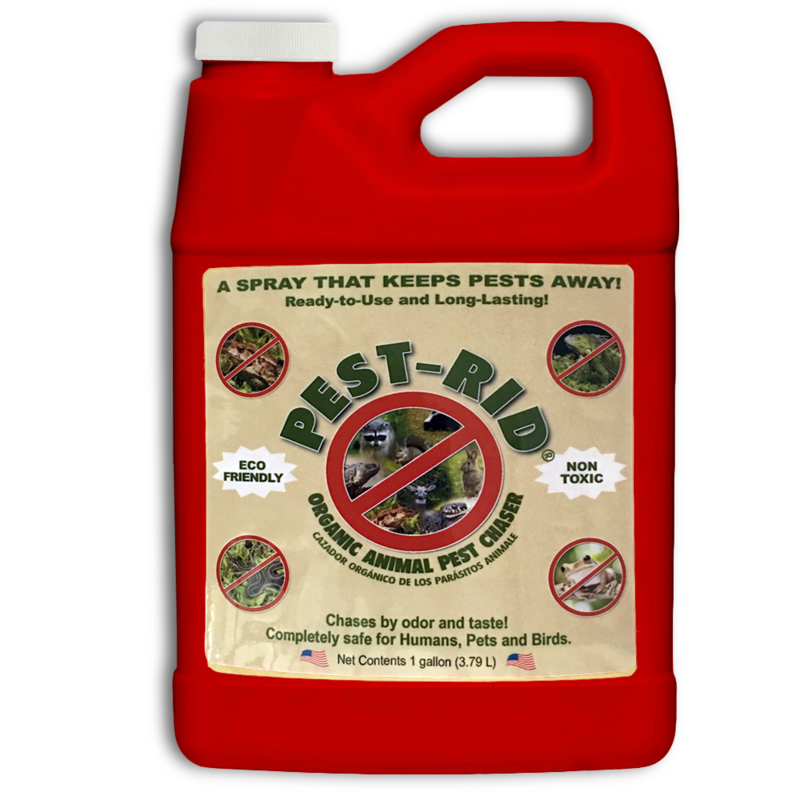 PEST-RID is an all-natural pest repellent spread which helps protect Homes, Pool Decks, Plants, Trees, Flowers, & Shrubs from Iguanas, curly tails & other lizards, squirrels, rabbits, frogs & toads, ducks, geese, snakes, deer, raccoons, skunks, etc. As well as garden pests such as mealy bugs, beetles, white flies, thrips, leaf-chewers, aphids, spider mites, snails & more! Spread around trees, shrubs, flowers, vegetables, walkways, docks, roof tiles, pool decks, or any other area where control is desired. WOW.. We bought the Pest Rid exempt 32 oz spray bottle to rid ourselves of tree frogs in our hunting blinds in the woods. Never have we seen a product work so fast! The frogs were actually racing out of the shooting house. Thank you for a great product that really does the job. We will be ordering more soon. 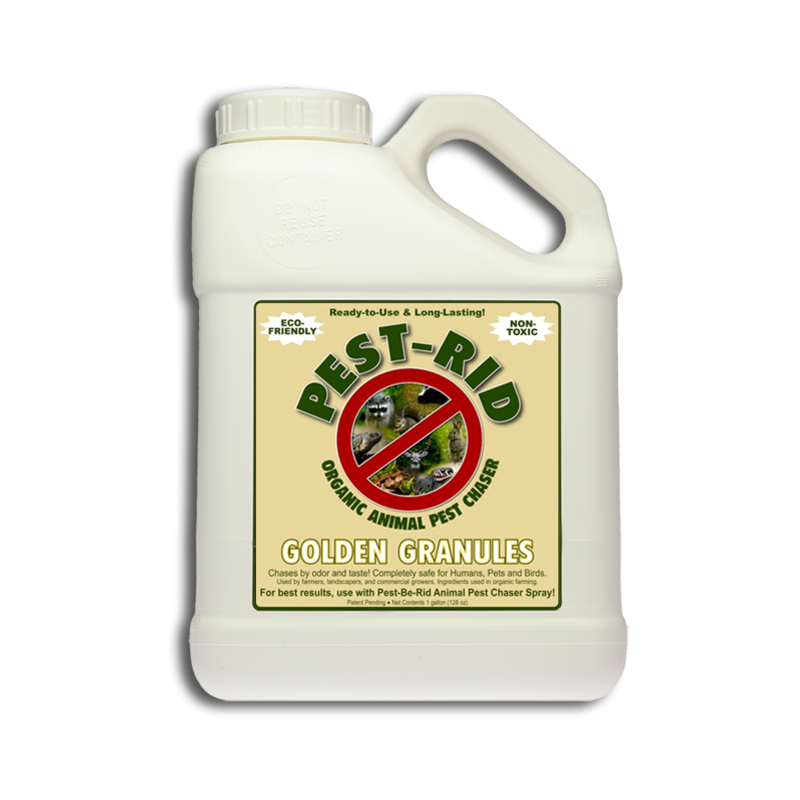 I sprayed vinegar, lemon juice, set traps, used lizard repelling granules and got rid of their food source with a pesticide but this Pest Rid Spray worked the best….it smells pretty strong but the scent does fade and there will be no more reptiles in site! Highly recommend! Thank you! Haven’t had the toads chirping since applying. Great! I have not seen a gecko near my door since I used this spray. This product is great. Frogs! Squirrels! Our neighbor has a abandoned pool which has led to heavy frog activity. This year they started to take over our yard too! Hundreds of them big and small. Bought both the dry pellets and spray and treated the mulch surrounding our back yard. That night the frogs are gone! It’s been two weeks so far still no frogs. We also have squirrels or a really big frog digging up our mulch, with this product they have seemed to stop also. Now the mulch in the front is being dug up, gotta order more! Very pleased with product and results! This stuff worked great the first day. Chased 3 frogs away. Still working after 2-3 weeks. The frogs were making a mess in two corners of my outdoor cabana every night. Since spraying there is no mess anywhere. Only issue is the nozzle provided with the quart size. The “stream” and “spray” openings both worked about the same as a spray. Seems to have helped but not all the bees are gone as of yet. Will keep spraying every evening and see if it is totally effective. Really works! It’s been two weeks and I only seen one toad after a heavy night of rain and it did not stay. I have almost 3 acres and used it around my home and walk way. Before using pest rid I had many holes and in my fenced area and toad around my home and walk way. I was worried about my dog getting a hold of one. I was doing salt, coffee grounds, rocks in holes and would of done a toad dance if I thought it would get rid of them. I am so amazed how fast and long Pest Rid has worked. I will be using it again in another week and if it keeps the toads away again and for a longer time, I will order more. Right now this is the only product that has worked.